What do you appreciate about the Earth? 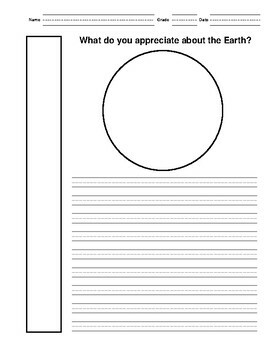 Students can write about the part of the Earth that they appreciate the most and explain about it. I talk about the Land, Water, and Air and also different habitats such as deserts, rainforests, oceans, rivers, lakes, mountains and etc. I ask them to write about what is personal to them. It is important to connect the theme to their activities and things they like to do so they can write creatively. They need to relate to the subject personally so they can think about it deeply.